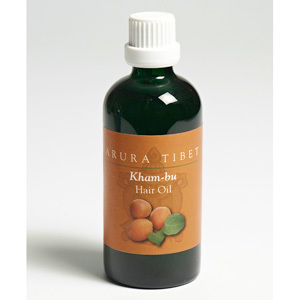 Arura Tibet Kham-bu Hair Oil is based on Tibetan medicine. Kham - bu hair oil nourishes the roots and stimulates the scalp. We use so much in the way of hot hair dyers, strong chemical hair colours, harsh shampoos and because of all these we need to respect our hair and scalp. Using hair oil has been practiced for thousands of years in Tibet as well as in other Asian countries. 	Apricot kernel oil (kham-bu sNum), used for hair growth, amenorrhea, blood circulation. In a Tibetan song the singer says "flowers are beautiful for the eyes, apricot is delicious for the mouth and I wish I could stay the whole day beneath the apricot tree!" Apricot kernel oil is good for sensitive, dry skin and also has excellent skin softening qualities. 	Hemp oil ( So ma ra za ) used for dry scalp, skin disease, hair damage such as that caused by blow- dryer heat, chemical perms, hair colouring. It also helps for hair shine and gloss. 	Rosemary increases the circulation of the brain and nervous system , helps to improve concentration and memory. It also treats problems of the hair and scalp. 	Jasmine ( Sin -shing- nama) - jasmine is very uplifting and a relaxing floral scent. It remind me of India where I was born! 	Emblica officinalis Extract ( Kyu ru ra ) - cooling potency and used as a blood purifier, for blood pressure, diabetes and hair loss. It contains high levels of vitamin C. Our head is like a chimney so cooling the head is very important. * Limonene, *linalool, *Benzyl Alcohol, *Benzyl Benzoate, *Eugenol, *Farnesol - Chemical constituents naturally occurring in the essential oils. Directions - Massage into hair then wash off using shampoo. Caution: Do not use during pregnancy and epilipsy. External use only.